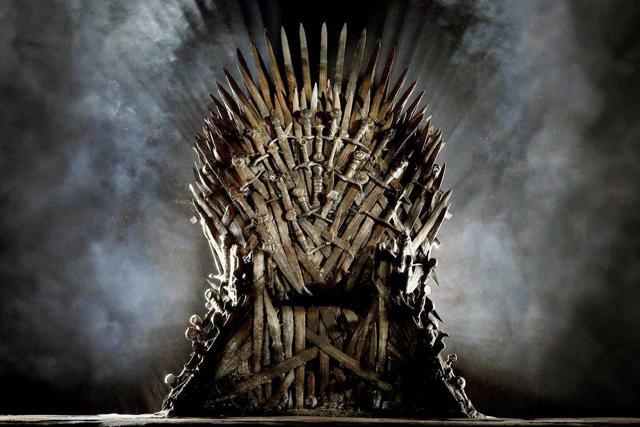 Why bitcoin will lose its throne in the crypto world. The winner will be the one with absolutely no scaling or performance issues even if billions or trillions of devices operate on the network. Blockchain was the first but not the last solution. Cryptocurrencies such as bitcoin will be the future of money. They are programmable and can be divided in very small sums of money, currently the extremely low cost transactions for IOT devices, etc. is not possible, but all this is changing fast. 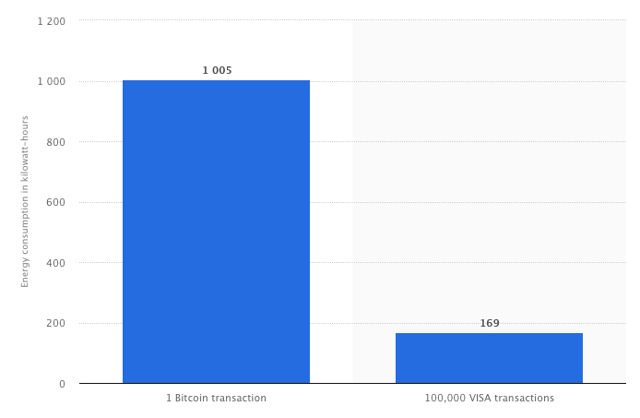 The bitcoin network currently has a limit of about 7 transactions per second, not even close to worldwide payment networks such as Visa (NYSE:V) that can process more than 25 000 transactions per second. This is because every "node" (active participant) on the bitcoin network must verify every single transaction and reach consensus, otherwise the transaction fails. The miners who unlock the transactions by solving complicated cryptography compete for the highest paid transactions, so anyone who wants to send bitcoin on the network must pay a price these miners are willing to unlock the transaction for; the higher the fee the sender applies on the transaction, the faster the miners will solve it and your transaction passes through to the receiver. Meaning the price Mrs. Market currently puts on the bitcoin network is worth 90 billion dollars, a drop from almost 360 billion dollars at its height in early 2018. Then it was priced in a remarkable growth of users and capabilities of the blockchain technology. Since then that pricing has decreased substantially as Mrs, Market has become more aware of the drawbacks and implementation time of features, etc. as all new technology faces. The blockchain technology enables a unique way for people who don't know or trust each other to do business, never before seen in the human history. A middle man has always been needed, kings and emperors ensured safety for trading and punishment for those who counterfeited its coins; and more lately, banks or card issuers such as Mastercard (NYSE:MA), Visa or American Express (NYSE:AXP) has taken over that role, charging a hefty price for that security as middlemen (see Kroger bans Visa). Bitcoin's current limitations on expensive mining fees and low transaction capabilities will soon be all but a memory. Extensive testing is currently being done with the Lightning network that enables everyone with a lightning compatible wallet send and receive Bitcoin instantly at practically no cost. I won't go into the details of how the lightning network works here as it is not the purpose of the article, but it adds a layer on top of the current bitcoin network so it uses the same immutable, unhackable (The bitcoin network has never been hacked during its 10+ years of existence) network as bitcoin while at the same time enabling instant and free transactions. The Lightning network is not a far-off dream, it is a reality being tested as we speak, the technology is there and will be implemented as soon as it has been tested enough. As you now understand, dear reader, I am very optimistic about cryptocurrencies and bitcoin. I believe Bitcoin is digital gold and will cost multiple times more in one to three years. However, bitcoins have some serious drawbacks even if we assume a fully functional Lightning network. 1. Lightning network still runs on top of the bitcoin network, so people must occasionally sync their nodes with the main BTC network. And that network is largely unscalable and close to its maximum number of transactions of 7 per second. What if billions of users or even trillions (including IOT devices) must at one point or another sync their node with the main bitcoin network. How are 7 transactions or even 100 times more (assuming they manage to make it 100 times faster) 700 transactions per minute going to work? Not good. 2. Bitcoin miners compete to "solve" the transactions the fastest by using computing power. The fastest solver of the cryptography will win the transaction fee. Bitcoin miners currently use more electricity than the entire country of Belgium. As the algorithm is designed to become exponentially more difficult how will the electricity consumption of miners become more environmentally friendly? Actually, it is a huge surprise to me that environmentalists aren't aggressively attacking bitcoin because of this. The only reason I can think of is the lack of knowledge of environmentalists on this issue. Also, where are most miners active? In the country with the cheapest electricity, which happens to be China with over 50% of miners. Where does most of the electricity come from in China? Environmentally friendly sources? No, Coal. Say in 2022 billions of users use bitcoin and the Lightning network and BTC are priced at 50 000 dollars, how much electricity will miners consume by then? My guess is about 10-50 times more electricity than now. Totally unsustainable for the environment of the world if not miners are forced only to use solar, wind, hydro, etc. And still, it's not a good solution as this electricity could be put to better use than to compete over a few microseconds to solve a block of transactions. These issues are of course not discussed widely in the bitcoin world as there is no solution for it. If not bitcoin and blockchain then what? Digital programmable money is the new economy, it is the force that will enable tiny microtransactions to be sent across the planet instantly without the need for a middle man to take a (too large) cut for the security. If there was a technology offering us the chance to "speak" to each other by sending micro sums of money the world economy would benefit greatly, especially poor areas. The solution lies in a less known form of digital money called Holochain (HOT-USD). It uses cryptography like the blockchain to protect users and transactions, but instead of being open and visible to all it is a peer-to-peer network similar to the HTTP protocol of the web. 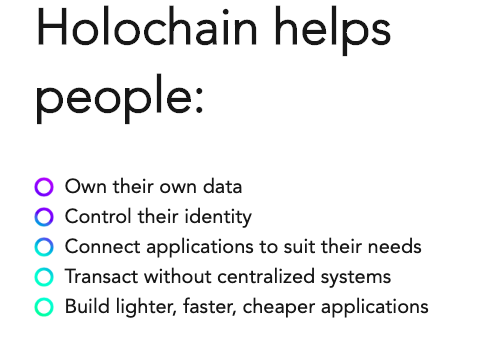 Where the bitcoin network functions like one global database protected by the amount of work put in by miners to solve transactions and require all nodes to be in the same state as the main network, Holochain use an "agent-centric" approach. Where cryptocurrencies based on blockchain require all participating computers to hold the same state, Holochain does not manage consensus on global state, rather it provides a global view to validated local state changes. Instead, all agents store their own data on their local "hash chain" (a tamper-proof protocol) and then all "public" entries are published on the public chain which is globally accessible and can be selectively shared. By being tamper-proof it is impossible for anyone to alter or change the data and the transactions it stores, the agent or user could then choose to share some or all of the data from its hash chain to other agents to validate its transactions. Every agent also has its own identity and can be identified on the network, similar to how a user name on Seeking Alpha works. And a public storage system called a DHT (distributed hash table) stores vital parts of an application. Making sure a malign user/agent who perhaps hacked his own version of the application can't alter or change any other data except for his/her own device. Because the DHT holds the validation rules for the app, a new or hacked app won't be permitted to send or receive data and has therefore (forked) and created a similar but entirely new app. The participants of the original app must always follow the same validation rules set initially by app creator and everyone who downloaded that same app, when two or more agents/users download an app a DHT is created between all the participants on the app network. If a third device wants to join it can download the same app and will be allowed to operate as long as it follows the initial validation rules. Going back to the hacker, since the hacker has its own unique user name it can now be identified by whoever it wants to communicate to and the app will automatically check with the DHT if the app validation rules are followed. If not, it will "gossip" with other agents it has communicated to previously that this new agent does not follow the rules. The benign agents inform each other about the hacker, allowing everyone to recognize them as a rule-breaker and block them. This enables a kind of immune system on the network to self-heal even if multiple agents use a hacked version and is attacking the network. Because of the agent-centric approach rather than the yes or no consensus blockchain uses, different levels of authority or access can be created in apps by the app developers. Holochain uses something it calls "proof of service" which is the history of a device service of storage to other people. Holochain is a framework for distributed apps and Holo Host lets anyone and any device with an internet connection store data, apps, etc. on the network like servers and get paid in Holofuel (the first currency of Holochain) for that service. As I briefly touched before, for every new app created and stored on Holochain a new independent network is being created powered by the devices which store that app and not the whole network, like the case of Ethereum, the second largest cryptocurrency by market cap which acts as one gigantic distributed computer. What happens instead is that as soon as a new app is published on Holochain a new network is created with its own rules and DHT, the network operates independently of other networks on Holochain and is hosted by the users who use the app or the app creators who buy hosting from the Holo Host marketplace. Devices can compete on lots of different parameters such as regulatory compliance (e.g., medical patient protection laws), massive redundant storage for low cost, etc. or simply the best track record or best price of hosting. It is like having your own blockchain for each smart contract or app. Like blockchain, many tokens and currencies can be created to run on Holochain. You could build an exact copy of bitcoin running on Holochain with exactly the same functionality as bitcoin (and limitations if you like). And each agent can be part of many networks and talk to them; Holochain is like a language. By installing a Holochain app or Happ and following the validation rules and DHT, it is like your agent now learns to speak this new language with the other agents who also speak this language. Bridging between apps is an agent who learns to speak both languages. For example, say you schedule a meeting with your calendar app, your calendar app could then connect to your weather app to see what kind of weather it is going to be that day and if rainy connects to your taxi app and orders a taxi for that day. LowcostNews wants to use freelancers to produce articles, but has no way of paying them in a satisfactory way. The freelancers are unhappy with waiting until the end of the month to get paid and unhappy with the terms of only getting paid after the article reaches 1000 clicks. LowcostNews does not want to pay for articles with less than 1000 clicks because no advertiser wants to pay them any money for less viewers. Everyone is unhappy with transaction costs of payments. Say LowcostNews set up its web platform on Holochain, now users can connect their wallet app to the LowcostNews app directly in their browser if preferred and users can pay microtransactions for the articles they read, instead of paying a large monthly subscription for full access (something many users don't want). They now pay just a tiny amount for the articles they actually read. Users of www.lowcostnews.com will now pay a fraction of a dollar per minute they read the article. This will incentivize freelancers to produce high quality articles which capture readers to read more, not just click-bait. Saving readers' time since they know the articles are well-written and make sure readers come back for more high-quality articles without the hassle of paying a high price for something they don't want. LowcostNews will take a fee of say 25% of the sums and send the remaining 75% directly to the freelancers' wallets. Freelancers are happy because they get a small, steady daily stream of microtransactions and it only cost them a 1% fee regardless of the size of the payment. Freelancers may even start using their own idle capacity on their own computers and smartphones to host www.lowcostnews.com and charge a fee for the hosting, giving them two incomes plus making them more loyal and committed to the success of LowcostNews. Holochain enables anyone with idle capacity on their phone or computer to sell storage on their marketplace. Heck, if they like to, they can even set up their own currency on Holochain and get paid in that from its users/readers. Reselling their currency to readers on a regular basis, it could even pay its staff in the currency because they could easily go and sell it on cryptoexchanges like Binance to whatever currency they prefer. Their new currency would now be a way for them to get new capital into their business and at the same time make lots of cost efficiencies in their current business. 1. Create a coin from nothing. This type of business model is the future, I am sure we will see lots of them. There is a race for the throne among cryptocurrencies, and bitcoin is in the lead with the first mover advantage. I do not believe bitcoin will ever die as it only needs one single device to hold a copy of the bitcoin network to survive. And I therefore believe it is very likely bitcoin will still be around in a 100 years. Many cryptocurrencies offer what they claim to be better technology than bitcoin and some do, but size matters and bitcoin has the most users, developers and miners in the world. Therefore, for a new technology to topple or rival bitcoin and blockchain, it needs to be more than much better, it needs to be totally superior. Holochain takes a completely different approach for securing transactions with its DHT and agent-centric focus. It works more like the human immune system where viruses and malign-bacteria are identified and isolated. It enables fast and extremely low cost transactions on the network while at the same time, lets anyone with a computer or smartphone sell its extra processing power for money. It will outcompete most servers since it will be impossible to compete with all the computers and smartphones in the world. An app on Holochain can look like any app on your smartphone or like a website on your browser. It has huge economic benefits for sectors such as gaming; with its speed and agent-centric approach, it can enable gamers to play faster with each other with less lag since gamers can host the game itself between them. It can enable instant transaction between the gamers giving a remarkable gaming experience. Lowering the barrier for sending and receiving money will bring millions if not billions out of poverty and enable them to compete in the global economic marketplace and make the middle man unemployed, but increasing efficiency greatly. I strongly believe Holochain will succeed since everything already is in place and is in its last phases of testing. The last seven days' average of Holo (the coin on Holochain which will be swapped to Holofuel when the network goes live) is 0.0013 USD. When the network goes live as it will during Q2 2019 and people start to understand what can be done on Holochain, price will explode. My target for one Holo is 0.01 for 2019, 0.1 2020 and 1 USD for 2021, the risk reward ratio is huge. This is a once in a lifetime opportunity and you will regret if you miss out. Buying Holo ticker HOT is best done on Binance as they have the most volume. If you need help buying cryptocurrencies check out my Instablog and "how to buy crypto." Disclosure: I/we have no positions in any stocks mentioned, but may initiate a long position in HOT over the next 72 hours. I wrote this article myself, and it expresses my own opinions. I am not receiving compensation for it (other than from Seeking Alpha). I have no business relationship with any company whose stock is mentioned in this article.